This document is a contract. Client is responsible for reading and understanding this document in full. Contact our Sales Representative should you have any questions pertaining to this document. No modification or addition to these Terms and Conditions is effective unless it is agreed in writing by the CELEBRATIONS. Definitions: “Client, you, and your” refer to the person who signs these Terms and Conditions. They do not refer to anyone else, including third parties, event hosts, staff, or guests, or end users of a rental item. CELEBRATIONS GROUP refers to CELEBRATIONS, GERVAIS, PARTY TIME and BENCH & TABLE.“We, us, and our”refer to Bench & Table Rents Inc. and its employees. CAP (“client authorized partner”) is the Caterer, Coordinator or any other representative who is authorized to make reservations, orders, order modifications or changes to and for all rental contracts of each event date or period. CCO(“client counter order”) is the act of a customer coming to our warehouse to collect a rental item. Return is the act of a rental item being transferred back from the client to CELEBRATIONS GROUP, typically on the return date. A return can be done through a client return or a pick up. Client return is the act of a client coming to our warehouse to return rental item(s). Pick up is the act of CELEBRATIONS GROUP coming to the client’s venue to retrieve rental item(s). To place a new Reservation and party Rental Contract with CELEBRATIONS GROUP, we require a minimum of five (5) business days prior to delivery. Clients must give a modified delivery reservation notice to CELEBRATIONS GROUP no less than three (3) Business Days before the Delivery Date; failing to do so is subject to new order refusal. A. Confirmed reservations and Rental Contracts require a non-refundable initial deposit payment of 30% on all orders and a client signed agreement of the Terms and Conditions. The remaining balance of the rental agreement must be paid 72 hours prior to delivery / CCO. If you do not meet this term, CELEBRATIONS GROUP reserves the right to cancel the order without refunding the initial payment. B. The Client accepts that transcription of verbal orders by telephone are subject to human error. CELEBRATIONS GROUP recommends all final communications should be made through email. All reservations are solely the Client’s responsibility to verify that the contract is accurate and that it contains no data entry errors, a minimum of 72 hours prior to delivery / CCO of the order. CELEBRATIONS GROUP picks and packs according to the contract and is not responsible for items that the Client assumes are being rented but are not in fact listed on the contract. Clients are also responsible to verify and ensure all shipping / logistical information is valid and the proper dates and times have been recorded. C. Availability– Client acknowledges that the rental is subject to the availability of the Rented Materials and personnel for the Delivery Date, not with standing CELEBRATIONS GROUP acceptance of the Deposit for the Client’s confirmed reservation. If any Rented Materials is unavailable for the Delivery Date CELEBRATIONS GROUP shall offer a reasonable substitute (also subject to availability for the Delivery Date) and the Client shall have the option to accept the substitute or eliminate the Unavailable Item from the Rented Materials. If no reasonable substitute is available, CELEBRATIONS GROUP shall give notice to the Client who agrees that the Unavailable Item shall be deemed to be removed from the Rented Materials, without any further obligation nor liability to CELEBRATIONS GROUP. D. A valid credit card number is required and will remain on file for the duration of the rental agreement. You authorize us to apply any rental charge or additional charge to this credit card. Depending on your preferred method of payment, a pre-authorization might be taken on this credit card. Administrative charges may apply if this credit card is declined, or if there is a charge back. The credit card number is held for security until all items are returned in proper condition post event. The authorized reserve amount of the security deposit will be determined based on value of the order. E. The Client who has been given terms for payment acknowledges that all discounts are pending payment date and that discounts may be lost for late payment as indicated on the final page of your invoice. G. You must immediately notify CELEBRATIONS GROUP if any of your contact information (e.g. your address, email, or phone number) has been changed or is not entirely valid and up-to-date. A. Orders cancelled with less than 72 hours’ notice prior to delivery / CCO are subject to a 100% cancellation charge. Upon return we will not issue refunds for rental items not utilized or ordered in excess. B. All modifications to the existing contracts must be made 72 hours prior to delivery / CCO. Cancellations or modifications of equipment or services within 72 hours’ notice prior to delivery / CCO are not refundable. C. A custom order is an order that includes at least 1 item that is not currently in our regular inventory. Once a custom or final sale order has been confirmed, the transaction is final. Thereafter, any modifications, additions, removals, or cancellations to the order are subject to a 100% cancellation charge. D.The Client acknowledges that there are no refunds or other adjustments to the Rental Charge for any Rented Materials that are picked-up and/or returned unused. A. For all orders that require installation and placement of the Rented Materials at the Event Site, the Client’s delivery reservation notice must be accompanied by a completed and signed Logistics Form together with a detailed floor plan that is accepted by CELEBRATIONS GROUP failing receipt of the required notice, floor plans, schedules, distribution info, and/or the CELEBRATIONS GROUP Logistics Form from the Client within the stipulated delay, CELEBRATIONS GROUP reserves the right to refuse distribution, installation / placement and/or delivery to on site requested areas. B. All deliveries and pick-ups occur during our regular hours within an 8 hour window during the following time span: Monday to Sunday from 8:00-16:00. Regular scheduling does not include Saturday & Sunday from January to April. You may request a shorter time window (e.g. a 4 hour window) or a specific time delivery (e.g. a 1 hour window) for an additional charge. We can also provide delivery or pick up of orders on holidays, or outside of regular business hours, for an additional charge. C. No liability will be attached to CELEBRATIONS GROUP for any delay or failure to deliver or pick up due to circumstances that are unforeseen and/or outside of its control (e.g. traffic, weather, venue complications). D. All deliveries and pick-ups must be made in an area readily accessible to trucks. Standard time awarded to each full truck for delivery or pick up is 2 hours. Additional charges will apply for long carries, stairs, elevator deliveries, any other obstacles which incur extra time/labor and repeated delivery or pick up attempts.Waiting charges will apply for any duration of time our staff are sitting idle at (or near) the venue without the ability to deliver or pick up the rental items. Waiting time begins after our staff have been waiting at the venue for more than 15 minutes. The Client shall pay CELEBRATIONS GROUP for the additional labour in an amount equal to $45.00 per man-hour per hour of delay. E. Upon delivery, you or the authorized representative of your team must be present to cross reference and examine the rental items for accuracy, condition, and quantity. The delivery form must be signed which confirms the above mentioned verification. If you cannot meet this term, our staff will leave the rental items in a predetermined area, and they will be deemed as accepted by the Client. Once you accept the rental items, you agree that the order was received in full and all rental items are in a proper functioning state. No discrepancies in item quantities will be accepted thereafter. F. All rental items must be promptly returned on the return dates specified in your contract. At our discretion, we may charge you additional rental charges, on a daily rental basis, until all items and accessories are returned to us. G. All rental items must be ready for pick up at their scheduled times. Unless otherwise contracted by CELEBRATIONS GROUP, additional charges will be applied if not all the items have been taken down, placed into their original storage containers, packed, and stacked as they were received. Failing which to do so will incur additional charges. Installation and take down are not included within the regular delivery charges, unless otherwise specified on the reservation. H. Upon pick up, you and/or another member of your team must be present to cross reference and examine the rental items for accuracy, condition, and quantity. If you do not meet this term, you agree to accept our counts at the time of pick up. Losses and abusive damages will be charged for. I. It is your responsibility to return all rental items to us, including all accessories, in the same condition that you received them (see 7b). Items/Accessories that are not the property of CELEBRATIONS GROUP cannot be returned in order to “replace” our own items/accessories. A cleaning / adjustment charge may apply if an item or accessory is returned in a significantly or abnormally unclean state and/or has been modified. J. If CELEBRATIONS was unable to retrieve all the equipment on a pick up and you find missing/lost items after the scheduled pick up time, you are responsible for returning them to the warehouse in a timely manner. Replacement charges for missing items may be refunded if missing items are returned via client return within 5 business days of the item’s return/pick-up date. For an additional charge, we may also revisit your venue to pick up the missing items. The Client’s request to add items to the Rented Materials after the initial delivery may be accepted by CELEBRATIONS GROUP at its sole discretion and subject to availability and labour required to modify the Client’s original order. The Client accepts a minimum of $75 in rental equipment. If accepted by CELEBRATIONS then these additions fall in accordance with this Contract. The Rental Charge, Service Charges, the Deposit and the Security Deposit shall be increased accordingly for these additional items and services will be charged for accordingly. A. Rental items remain the responsibility of the client from the time of the delivery / CCO until the time they are returned to CELEBRATIONS GROUP. Nevertheless, the title of the rental items shall, at all times, remain the property of CELEBRATIONS GROUP. B. The Client assumes all risk and liability of damage, injury, illness, or any other form of harm including consequential damage, resulting from the delivery, transportation, installation, removal, usage, or storage of a rental item, regardless of fault. This includes, but is not limited to, damages to the venue, driveways, flooring, and/or the Client’s own goods. Prior to each of these activities, the Client must obtain at their expense all necessary permits, licenses, consent, and insurances. C. Rental items are to be used for their intended purposes only. You may not use the same items for more than one event and/or location. You may not sublease any items to any other person or third party. -Linens: Shake linens free of debris, food, etc. Do not place linens in garbage bags that could be mistaken for trash. Utilize the clear bags that we can provide upon request. -Glassware: Empty glasses of all liquids and return in their original boxes with their stems up. 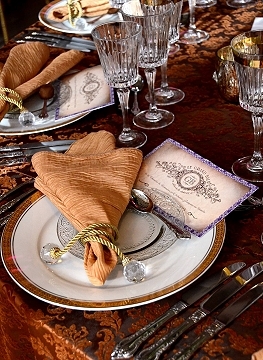 -Silverware: Separate cutlery as they were received: dinner forks, dinner knives etc. -Dishes: Remove food, wipe plates clear of food, and place in respective crates. Do not over pack the containers, cartons, and or boxes supplied for all of the above. A. In the event that a piece of our equipment malfunctions, it is the client’s responsibility to contact us at 514.738.4755, successfully and immediately. During our opening hours, a sales consultant will assist you. Otherwise, listen to the message; you will be directed to our emergency phone line. Call this number to speak to an after-hours operations manager, available every day from 6:00 AM to 11:00 PM. If necessary, leave a voicemail message and be ready to receive a response within one (1) hour. B. At our discretion, we may replace inoperable equipment during working hours free of charge. However, if a technician is dispatched, and we deem the equipment to be functional and the inability to operate it to be the user’s fault, additional charges may apply. C. In the event that we deem a piece of equipment to be in an unsafe or hazardous condition, we reserve the right to immediately take possession of it and to remove it from the venue. A. CELEBRATIONS GROUP damage waiver is mandatory to all of our Clients; it is automatically added to your rental contract. The damage waiver covers you exclusively in the case of accidental damage or reasonable breakage. In order to be eligible for protection coverage, you must return damaged items (or all pieces of a broken items) by the return date. Charges for deemed lost items may be refunded provided the Client returns the broken and/or missing items within five (5) business days of the Return Date.